MILLEDGEVILLE, GA, FEBRUARY 4, 2019: On February 23, join the Milledgeville Museum Association for the first “Milledgeville Progressive Dinner” featuring an exclusive after hours look at three of Milledgeville’s historic and cultural attractions. Guests can anticipate delectable eats and drinks at distinguished sites, sneak peeks of rare collection items, and meet and greet opportunities with each site’s director or curator. Guests are invited to start the evening with cocktails at Andalusia, travel to the Museum of Fine Art for heavy hors d&apos;oeuvres, and wind down at Lockerly Arboretum’s Rose Hill for a coffee and dessert reception. 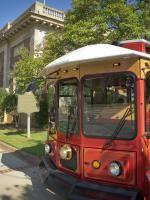 ‘Milly’ the trolley will transport guests from one location to the next. The cost is $50 per person. First settled in 1814, Andalusia was a cotton plantation and farm until it was purchased by Flannery O’Connor’s uncle Dr. Bernard Cline in 1931. During Flannery’s residency, 1951-1964, she completed the bulk of her literary work, as the farm’s environment influenced the setting of many of her writings. Matthew Davis, Director of Historic Museums at Georgia College, is proud to partner with MMA for this event. “I hope the community will come out for this unique opportunity. Andalusia is a site rich with history, and we look forward to sharing information about Flannery O’Connor, her works, our recent renovations, and long-term restoration plans” Davis said. The Museum of Fine Art’s Laura Wilson states, “The Progressive Dinner represents an exclusive way for visitors to experience the Museum of Fine Arts. We are excited to participate in what will hopefully become an annual tradition in the Milledgeville Museum community." Participants will see the current exhibition, Sushi, Tomatoes, and Orange Julius, selections from the Georgia College Permanent Art Collection curated by Georgia College Museum Studies students. Jennifer Pollard, Executive Director for Lockerly Arboretum shares, “The MMA is a uniquely supportive organization for cultural institutions in Milledgeville, and Lockerly is proud to partner with Andalusia and the MFA to bring this exciting event to our community”. Founded in 1965, by Mr. E. J. Grassmann, Lockerly Arboretum boasts 50 acres of shrubs, trees, rhododendrons, a conifer collection, and an extensive camellia collection. The centerpiece of Lockerly is Rose Hill, a National Register, Greek Revival style home built in 1852 by Daniel R. Tucker. The Sip & See Progressive Dinner will have three ticketed dinner starting times, each departing at the Milledgeville-Baldwin County Convention & Visitors Bureau beginning at either 4 p.m., 4:45 p.m. or 5:30 p.m.
Tickets are available at the Milledgeville-Baldwin County Convention & Visitors Bureau, 200 West Hancock Street or by calling 478-452-4687.